– to remember those that perished, those that escaped, and those that helped their neighbors, and the hatred we hope to prevent. 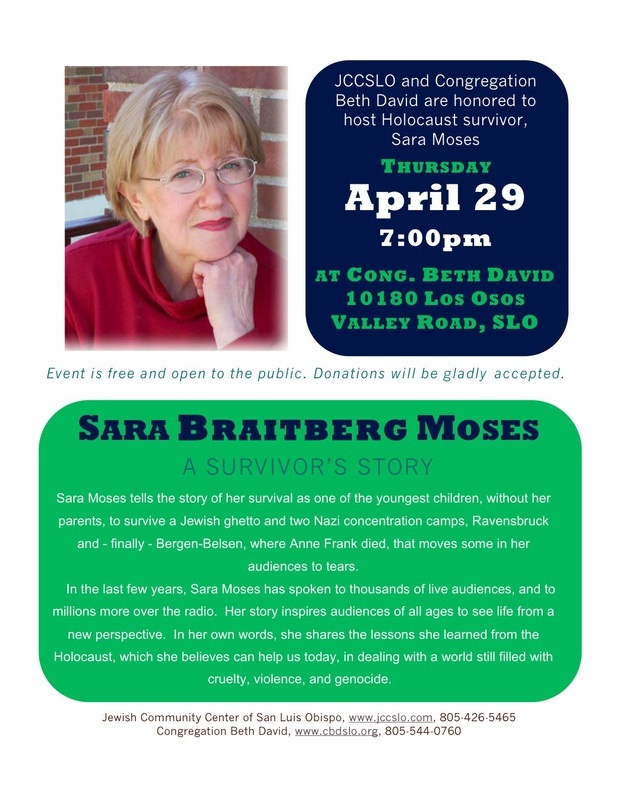 This program is free of charge and open to all. 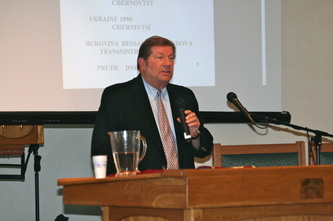 Julius Royal, World War II and Soviet-regime survivor and revolutionary. This year Cal Poly Associate Professor of Modern European History, Molly Loberg, will moderate the discussion. 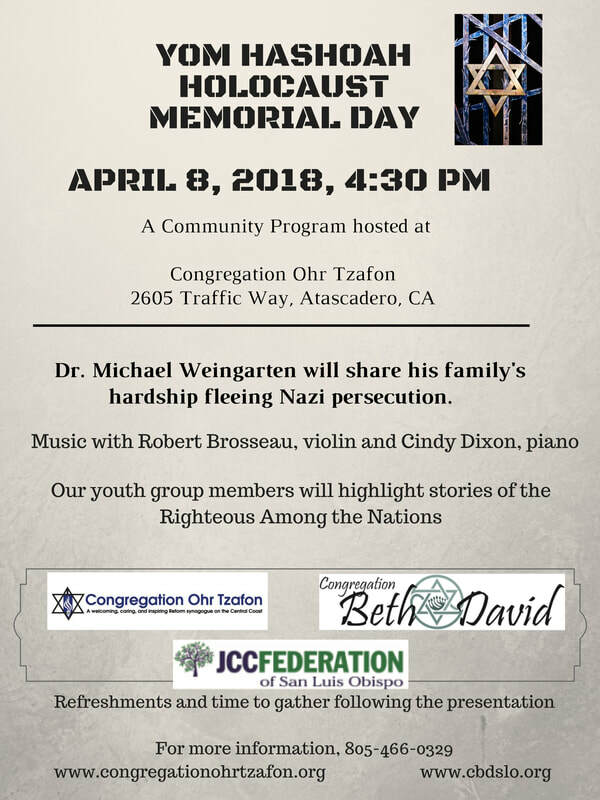 Commemorative music was performed by the Canzona Women’s Ensemble, including “Even When He is Silent” and “Reflections from Yad VaShem.” The Grande Ringers, performed interfaith music about peace. 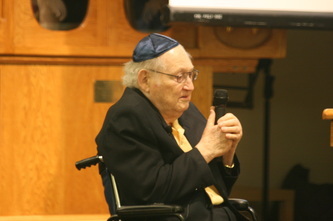 And, by tradition, teenagers led in a candle-lighting ceremony honoring all who perished in the Holocaust. 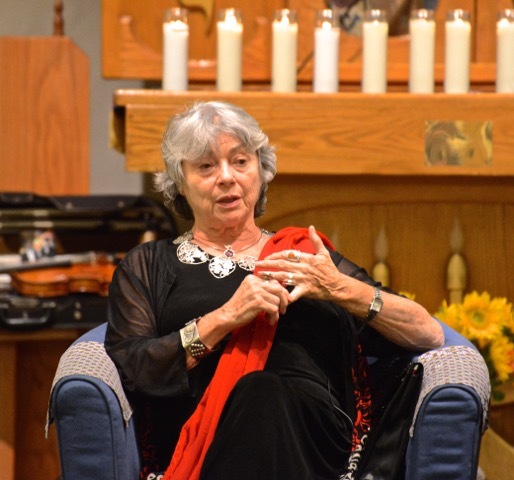 We were privileged to host Eva Nathanson at our 2015 Program. 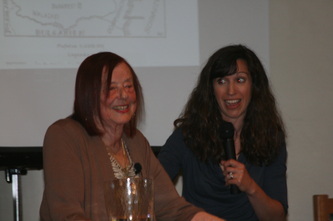 Ms. Nathanson recounted her stories from a unique perspective, as she experienced the Holocaust as a young child. Speakers Ruth Cairns Baker and Daniel Deitch were featured in our 2014 program. 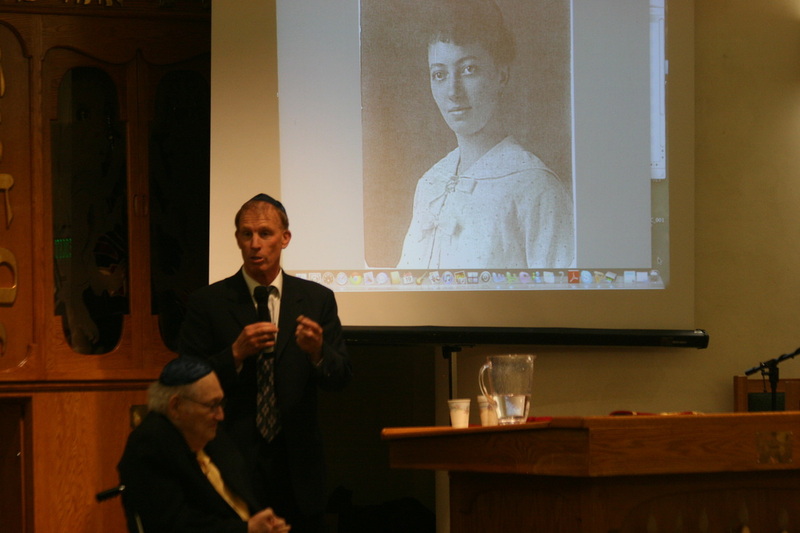 Ruth told her personal story of underground escape from Vienna; and Daniel Deitch, talked about being the grandchild of two Holocaust survivors and the importance of carrying on their stories. 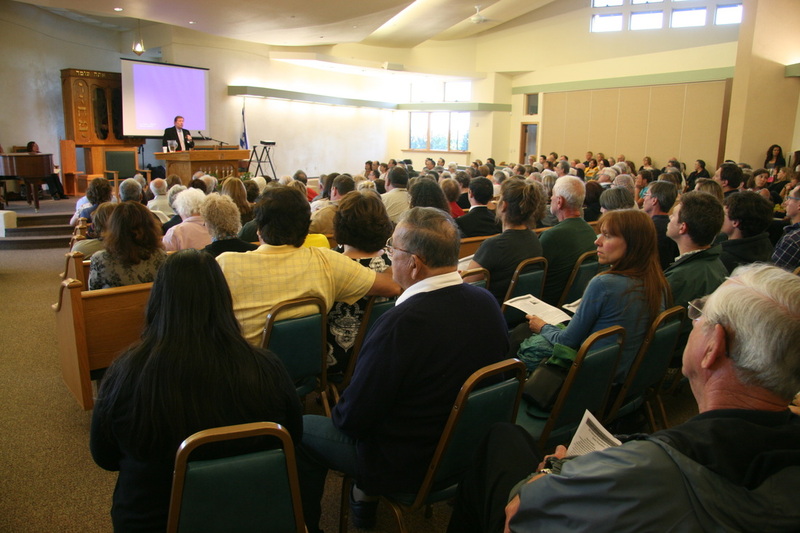 A DVD copy is available from the 2014 program. Please inquire here. We thank Martin Friedmann-Petrasek for talking to us about his experiences during the Holocaust. 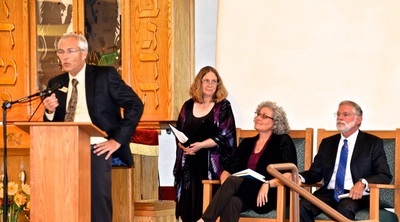 The program also included musical performances from the San Luis Obispo High School Concert Choir and a community congregational choir, as well as liturgy from Rabbis Linda Bertenthal and Janice Mehring. Thank you to all that participated and all that attended this year's Yom HaShoah program. Please click here to see the news coverage - thanks KCOY! Hundreds of community members joined to hear local residents, Bianca Rosenthal and Irving Klein share their stories of incredible survival during the Holocaust. 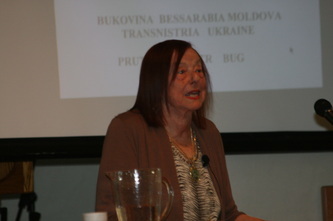 Bianca’s story gave an inside perspective to the Romanian Holocaust as she described her childhood survival of the Ghetto, deportations to Transnistria and Siberia, WWII and the Soviet rule. Irving’s story covered his life of survival after fleeing the invasion of Hungary. 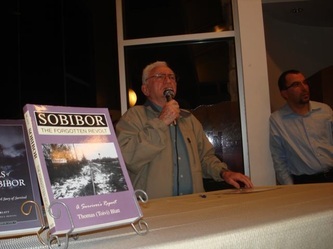 At the time a young boy Irving faced many life-changing decisions as he escaped death numerous times, only to endure the harsh beatings and treacherous work as slave laborer in the concentration camps. 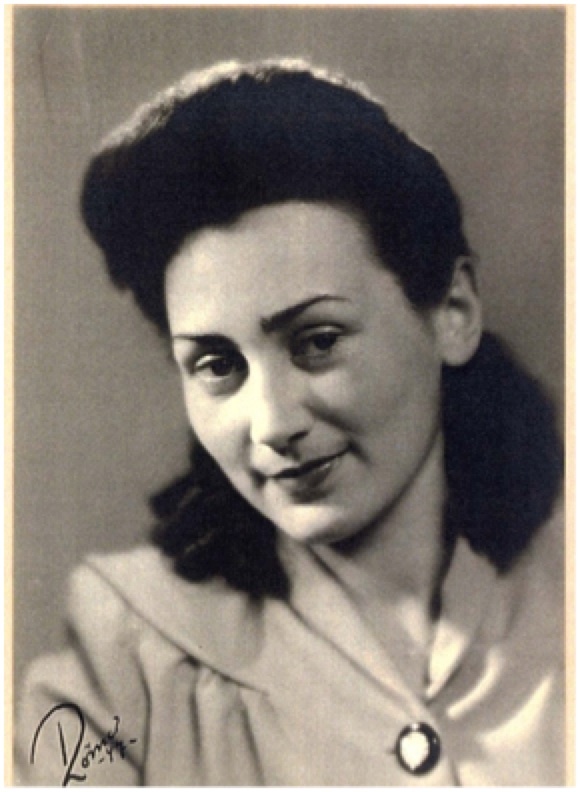 On April 28, 2011, Holocaust survivor, Helena Weinrauch, visited us and asked you read her story.